Blonde American Wild Ale that was fermented and aged in Chardonnay barrels with Missouri grown White Peaches. The Batch 1 cocktail for fermentation includes both spontaneously captured yeast and bacteria from our family's farm and our house wild blend. L - a million little bubble form and stay. awesome carbonation and a nice foamy/hazy peach color. its gorgeous. T - peaches!!! so good, super carb which makes it light and crisp and full of fruit. F - a bit acidic at first but the more it sits, the more fluffy and soft it becomes, bordering later on a creamy mouthfeel which is pretty awesome. O - One that I'm super happy to have finally scored. Side Project holds a special place in my heart and I consider moving to St. Louis overtime I have one of their bottles, just awesome stuff. Big thanks to dujayhawk for sending this one down! Reviewed from notes. Poured from 375 mL bottle into a Tampa Bay Brewing Company snifter. A: Pours a hazy light gold, with a thin white head and medium visible carbonation. S: Big funk, barnyard and horseblanket, less stone fruit, and some lactic tartness. Mild vinous character as it opens up during the drink. 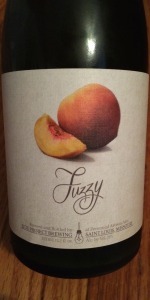 T: Funky tartness, lactic acid, an incredibly natural peach flavor. Some barnyard, milder barrel tannins, hints of the white wine. Nicely attenuated light malts, and puckeringly dry funky tartness. Finishes with some lingering stone fruit and bone dryness. M: Light body, good carbonation sensation, and an alcohol content that is VERY well-hidden for the listed ABV. O: This was really, truly, very good. Drinkable, but maintains the tart, funk and fruit that you're looking for. I truly don't know if it would be worth what it seems to be trading for, especially since it disappears from your glass before you realize it's gone. But it's really yummy. From 08/19/14 notes. 375 ml bottle poured into my Lost Abby stemware. Big thanks to BeerLawyer85 for sharing this one; thanks Ross! Pours a murky bright yellow color with one inch of bright white head. Super sour nose and taste, peaches, sour white wine, oak, floral notes. Taste is very vinegary and has more sour fruits and oak. Acedic , light to medium body. Overall a really good sour. Way more sour and vinegary than fruity, but really great. Worth seeking out for sure. Unfortunately, it's sort of one-note. It tastes like a sour, unripe peach. That's it. I wanted the Side Project funk, and it's just not there. It's just flat out warhead sour. Good, but I am wanting more. Pours a clouded amber to orange color with a fizzy, small head, which immediately diminishes to a small coating. Smells of leaf wrapped ripe peaches, offering a bright fruitiness, which comes close to actually cut a peach into half and enjoy its aromas. This inherits not only the fruit‘s pulp but also its stone pith quality, adding a soft soothing quality to the sprizzy, slightly perfumy and floral fruits. Has a higher, finely nuanced carbonation, with an effervescent finish, among a lighter, yet versatile and intense lighter body. While this is doubtlessly focussed entirely on peaches, the flavors of the beer offer an initial mineralic quality, white bread dough and matured, still slightly bitter herbs. Peaches enter the palate with an early fruit sugar peak, which stays till the end, but fades down slowly and constantly. The fruit itself is defined by a pleasant tartness, sweeter peach pulp, a light moldy touch among a flowery mildness, which allows a rustic barnyard profile, consisting of leather and cream cheese, to cut through. Develops an almost creamy finish with an astonishing smoothness of the fruits and a finely beaded mouthfeel, leading to a surprising, well interweaved juiciness, in which the maintaining tartness manages to shine. This tastes great, everything comes together perfectly, due to the beer‘s awesome mouthfeel and balance. It is just as complex as a Lambic with a cleverly integrated tartness, labeling this unmistakably a sour, but with a complexity which assures to be able to pick up the beer‘s subtle nuances. 375ml poured into a snifter at Happy Raven with friends in Lincoln, Nebraska. Smell - Funky peach cobbler! Taste - Funky peach juice. Acidic. Very good! Mouthfeel - Medium body. Medium carb. Very nice!